AEC Ship Hull Design generates a 3D associative model of the hull, and complements other CATIA modules (such as CATIA-CADAM AEC Drawing Production), providing a seamless set of tools of accurate, flexible and productive ship design and production. 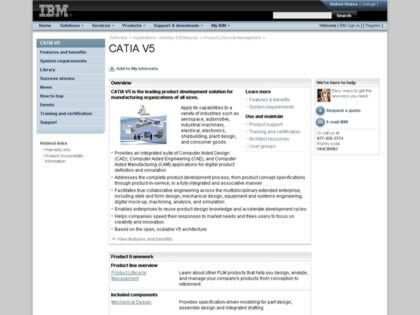 Web Site Snapshot: If available, above is a snapshot of the CATIA web site at http://www-306.ibm.com/software/applications/plm/catiav5/ as it appeared when this site was added to the directory or last verified. Please Note that Boat Design Net has no involvement with the above web site; all content and images depicted in the above thumbnail are the property and copyright of CATIA unless otherwise noted on that site. Description: AEC Ship Hull Design generates a 3D associative model of the hull, and complements other CATIA modules (such as CATIA-CADAM AEC Drawing Production), providing a seamless set of tools of accurate, flexible and productive ship design and production.